#46 - Teddy Smooth gets serious and unleashes a musical explosion! 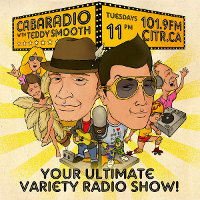 Get ready for a CabaRadio musical explosion! Tune in tonight as Teddy hits the studio solo and unleashes a fury of musical treats to fill your ears and inspire your feet. That's it...tune in tonight at 11pm and enjoy! Here's a couple music videos to make you smile through your day!